If you dogs' behavior is causing concern, please contact us. Reviews are a great way to see of our methods work. 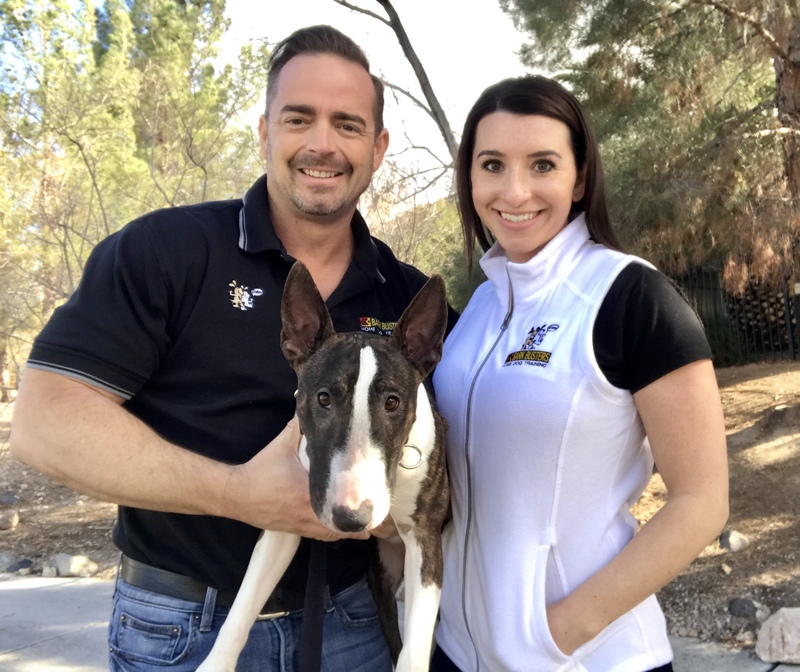 See what clients in the Reno area have to say about the Bark Busters dog training methods. Whether there is Barking, aggressions, anxiety or just a bit of training needed. We can help you, and we CAN teach old dogs new tricks. We got results instantly. Within 2 hours a dog that was anxious, only obeyed when calm and would not go outside due to fear would do everything we ask and would go outside on his own. JUST AMAZING. It seems unconventional at first, but if use the tools sh give you the results are immediate and last. We love Katherine from bark busters. She's very informative and knowledgeable when it comes to dog training. We have a chihuahua rescue that can't stand to be touched and barks non-stop. What a miracle he now knows we are pact leader and quickly let go of the job. Thank you Katherine job well done and money well spent. Katherine has worked with us and our 16 month old chihuahuamin pin mix. After only two sessions, we are noticing very positive changes in our dog. The Bark Busters Program DOES involve the owners working with your dog daily and consistently, while reinforcing what the trainer teaches. Katherine is an excellent trainer. She is knowledgeable and patient. She actually makes training fun. I would recommend her and this program to any dog owner who is looking for positive behavioral changes in their dog. My pup is an 8 yr old Shepherd/Beagle mix (Lady Belle), and she has recently been very aggressive with other dogs. She was also jumping when I would come home, and basically had the run of the house. After the first lesson with Katherine, Belle was already showing improvement at home with her dominance. Belle has completely stopped jumping on me when I come home. She had been showing some mild aggression with my two cats, and that also stopped after following Katherine's training for about two weeks. Mind you, this was after a single lesson! By the second lesson, after working on leash control, Katherine's Bark Buster method was so effective, she was kind enough to let me know that we didn't need to continue our lessons as long as I was comfortable. I absolutely was/am and couldn't be happier with the results thus far. three weeks in, and I can already see a change in Belle's persistence and aggression toward other dogs from working on leash control for two days. I can't wait for my pup to have some dog friends at the dog park, and I will be forever indebted to Katherine for her help. I love that this training can be done without treats too! I highly recommend Bark Busters to anyone who needs help training their dog. You will not be disappointed! Katherine was the perfect person to evaluate Gracie and show us how to help Gracie be the best pup she can be. We noticed improvement immediately after Katherine's first visit. It was amazing. I would definitely recommend Bark Busters and especially Katherine. She is very kind and caring, you can tell how much she loves the dogs she is helping!! Katherine was a delight. In my tense moments of despair over Nathans aggression...she managed to quell his behavior and my despair in one visit. Together we managed to fix the problem and I have tools that will lasts forever. Great investment! I have been very impressed with the results of the training methods taught to me by Mongo's trainer Katherine. The Bark Buster methods are incredibly simple and amazingly impactful. I have sought other trainers and used other training methods but none have worked as quickly and simply as those used by Bark Busters. I'm so excited to continue working with Mongo and Katherine. Katherine is very skilled at what she does. She has helped us to become more confident in training our puppy. While she trains the pet parents rather than the pet, she did demonstrate the Bark Buster techniques with our puppy and amazed us that she obtained the desired behavior from our puppy on her first visit! Make no mistake, this is not magic and still requires effort and consistency from the pet parents, but we are pleased with the new training tools she taught us. It was an excellent experience! Clear, succinct, easy to follow, simple instructions and so very HOPEFUL! A pleasure working with Katherine, who is clearly confident and knows dogs and teaching about dogs! I had been through everything to deal with my dog's separation anxiety - even after 7 months coaching from UC Davis' animal behavior program there was no change. None of the numerous medications made a difference in this dog - I began to think, "He's just a high-strung dog, he'll always be this way, just adapt as best you can John." After one meeting with Katherine of Bark Busters, there was an immediate change in behavior! Its been a month now and he's the perfect dog! All I can talk about is what happened with my dog but, believe me, he was as tough as they come. He is my 5th dog and I can't imagine any dog that would not get results from this program - its great! The theory behind the training was interesting and made sense. Kathering obviously knows what she's doing. Her confidence and aplomb was inspiring. She was patient and informative. Ryder and I reaped many benefits from her guidance. I couldn't be happier with the help and guidance that I received. I have a 7 year old Lab that was showing signs of fence aggression and couldn't go on walks because of her very strong pulling. Katherine not only taught me to be the leader and "speak dog", she guided me and supported me every step of the way. I am definitely still in training but she is only a phone call away. THANK YOU SO VERY MUCH!!! Barkbuster methods and training were easy to understand and seemed to help with the behaviors we were seeing in our dogs right away. There was a lot of information that made sense as far as why the dogs act the way that they do and so what we were being taught followed. Thank YOU. First time ever - Ms Aloha saw her first bunny of the season - hesitated and DID NOT REACT. I'm thrilled - followed your guidanceâ€¼ï¸. Bless you! Katherine is very patient, and really helped both me and Charley get a handle on what was going on, and how to best work with him. Charley responded very well to her, and the lessons were clear and understandable. Very good follow-up, and I appreciate the additional questions she responded to via email. I was so impressed with how reactive our Blue Heeler was to this training technique. It is so simple, easy to use yet so affective. Our trainer was an absolute pleasure, she never interacted with our dogs just showed us what do, which I love since we are the ones who have to use it once she left. Pepper was very aggressive with out other dog and with me, he also never came to me when I called, only my Husband. He would chase my horses and bite at them and was also nasty with strangers. Pepper has done a 180 in two sessions and just a few moments of practice daily. Katherine is amazing. As usual! Jester loves her and responds really well to her. If you follow her instructions you really can't go wrong! We never could have solved this German Shepherd puzzle without Katherine! As Stella's third family, we had some behavioral issues to fix and leadership to establish. Katherine broke down Stella's behavior to understandable dog terms, and gave us a strategy to improve it without using abusive techniques. Stella no longer ignores us, has crazy dominant behavior, jerks our arms out on the leash, or freaks out if we are not home. We are the leaders of our pack, and Stella is a happy part of it now! I am thunderstruck! I now have a dog that BEHAVES! My dog is 8 years old. I have had him since being a pup and tried EVERYTHING to get him to walk nicely on a leash, not charge out the door at every visitor, snap at anyone who approaches me. I thought I might have to give him up...then I met Katherine!! NO KIDDING, in two lessons, I have a NEW, VERY IMPROVED, dog! As they say, it is the owner who needs training...and I did, but Katherine explained and demonstrated everything VERY clearly and patiently. I highly recommend Katherine! Katherine's knowledge is awesome, fascinating, and incredibly effective. Without punishment or treats, my American Bulldog wants to please me because I am speaking to her in canine, telling her that she can relax because I am the alpha and I have everything under control. The methods are not actually taking any more time from my day because I use them as I do the things I would normally do. It's so efficient. I just need to remind myself how to behave as alpha, and how to make my communications clear. But that is all written down, and we practice it with Katherine. When I first called Bark Busters, the guy who answered asked what behavior problems I needed to address. For example, he suggested, is the dog eating the mailman (haha)? I said no behavior problems, I just wanted a good companion to come hiking with me. But as I look back now, boy, was I wrong! My dog's behavior started out shy when she came from the shelter, but it was getting out of control. I can see now that we were not headed in a good direction. Most of us humans don't understand we are leaving a power vacuum that our dog is not going to leave unfilled. I do think I make a better alpha than my dog Jewels does! For example, a friend with a large dog recently broke her arm when the dog bumped into her and knocked her down on the steps. Perhaps the dog was teaching my friend not to stand on her hind legs? (I'm joking.) Behavior on steps is something Bark Busters specifically addresses. So you have a small dog. Behavior problems can be ignored, right? Well, I learned from Katherine that they are still symptoms of dis-function in your "pack" that your dog will find troubling. And don't discount how unpleasant your small pets can be if they bark at every noise. There is one house I hate to visit because of the yappy little pests. Ugh. I suspect more than one marriage has foundered because the yapping drove one person crazy but not the other. If that sounds like you, don't nag your spouse to do the training, sign up yourself! Maybe your spouse will be intrigued enough to join in. So if you want to have a great relationship with your dog and a lot of fun, this training is well worth it even with small dogs. I could say especially with small dogs since your relationship will probably last longer considering the longer lifespan of the small dog. And if you have a big dog, good heavens, don't risk becoming a giant piece of road rash, call her right away! This program was amazing. After the first lesson I saw immediate improvement in my dog's behavior, not just on the issues we had worked on, but in everything. I had been struggling with my dog's generally pushy behavior in the house, but also her aggression towards other dogs. Walking the dog had become a major source of stress for me. I had to be hypervigilant to keep her out of situations where she would attack other dogs. But after one lesson with Katherine, Delta's behavior improved dramatically. The things Katherine taught me were SO SIMPLE, but so very effective. Now that I know how to be a pack leader and communicate my leadership to my dog, life is much calmer and I can actually enjoy my dog and my walks again. Because this method doesn't involve using treats to modify behavior it was so easy to incorporate training into my everyday activities. I didn't have to get get a pile of treats ready and then spend dedicated time training the dog. I just used my communication techniques whenever I went through a door, walked down the stairs, answered the door... I am just thrilled that we did this. It was worth every penny and more. Katherine was fantastic. She came out on a Sunday and explained to me the process in getting Choco and myself to become the best partners we can be. She showed me the different ways to solve our problems with a presentation showing the different techniques of the training program and by showing me how to speak dog. I am greatly appreciated for the time she spent with us. I now have a new friend. Just in the short time I have been using the proper techniques, I have noticed a larger difference in Choco and myself. I would recommend her in a heartbeat. After our first session Louie was more receptive to my instructions. Each day I saw him improve and become calmer and more receptive. He is becoming the dog I always wanted thanks to Bark Busters. Katherine was very patient with Scooter and me. Her knowledge, expertise, and positive training techniques created a very comfortable learning environment that has helped lay a solid foundation for Scooter. We had worked previously with two separate trainers with little to no results. To say my, Scooter, a Miniature Dachshund/Pinscher, is an 'Independent Thinker' would be an understatement. People love him, but Cute and Friendly is not the same as Calm and Quiet. The one-on-one approach used by Katherine in not only training Scooter, but also training me to understand what signs to look for in good/bad dog behavior has empowered me to do the right thing with Scooter. If you have brought a dog into your life and heart; you owe it to both of you to learn how to communicate and positively and effectively train them. I highly recommend training by Bark Busters to anyone that has any type of dog because it was extremely beneficial for Scooter and me. Katherine thanks so much for everything and Scooter thanks you too. I called Katherine because my two dogs wouldn't let anyone in the front door; they would rush the front door and bark non-stop whenever anyone other than my family came in the house. The dogs's behavior was driving us crazy! By the time Katherine left after our first session we had a concrete strategy to keep the dogs from rushing the door. With practice and reinforcement from Katherine, after 6 weeks, people can now come to our front door and the dogs will stay in the other room. away from the front door, and sometimes not even make a sound when the doorbell rings. The change in them is unbelievable! The reduction in the noise pollution from the constant barking has done wonders to decrease the humans' stress levels. Bark Busters techniques are simple enough that even my nine-year-old son can employ them which really helps with us being consistent. And the time commitment to the training is not overwhelming. If you can devote 15 minutes a day about 5 times a week for the first couple of weeks, you will see positive changes in your dogs without having to resort to any negative reinforcement or harsh training methods. And, you still get to spoil them rotten. Bark Busters is the best of both worlds. I am truly glad I called. My husband and I adopted a rescue mixed breed about 2 years ago. She was trained by the PUPS program at the local prison and had good skills but was terribly afraid of strangers, jumped on us and had terrible leash walking skills. In just 4 hours of instruction from Katherine Dee-Oh-Gee is amazingly calmer with strangers, doesn't jump on us most of the time or stops immediately when asked. She now stops barking when told and even is walking better. More practice is needed but we are thrilled with her progress. She's almost a new dog. Katherine is AWESOME. She helped us to understand how we WEREN'T speaking dog and why it is important to be the leader to get Coco to react properly. My husband and I look forward to practicing and getting Coco to be a happier and better dog. I wish I'd signed up for Bark Busters sooner. I have been working with Katherine for a few weeks. I have my Lani-dog and we are staying with my daughter who had two big dogs and one small dog. I am very happy to say that overall, all dogs are much better behaved when I am home with them during the day. They used to all RUSH at the back door to go outside at the same time. Very quickly, speaking dog, they now all stay back and look at me and proceed when I give them the OK. They bark much less TA DA. Lani used to whine as I got ready to go out; one or two growls and she rarely does it now. And she would whine in the car as we drove by places that I walk her and sometimes anxiously whine in the car for no apparent reason. She has stopped that and is calm and well behaved. I am happy with our progress and so appreciate the individual training especially for Lani. Even though my daughter doesn't chose to take the time to learn and work with her dogs now, she does notice they are better behaved and calmer. And my time with them is 100% better! Knowing I have support and guidance with Lani is so important. I feel much more equipped to own this beautiful and powerful dog that I so love. MAHALO! Katherine is so awesome.. I had real doubts about this program and wow I was wrong.my dogs had multiple issues and had control of the house.. in one session the barking and listening was almost squared away.. thank you thank you thank you Katherine. .can't wait for next lesson. .
My boyfriend and I moved from Sacramento to Reno last summer. When he was about 4 months old, our German Shepherd Riley started showing signs of aggression. We had him in training for a while, which helped a lot; but we were worried how he was going to react to our roommates when they moved in. We knew we needed to start with a trainer here in Reno, and after several different consultations, we finally found Kathy. We were a bit skeptical about the "Bark Busters Way" at first, but couldn't believe how quickly Riley reacted. After they all moved in, we had another session with our roommates where Kathy helped Riley adjust to them and taught them how to behave around him in the meantime. Long story short, now Riley loves them all! They play with him in the backyard, take him on walks, (and I know they feed him Vienna sausages when we aren't home). Thanks to Kathy, we now have peace of mind when we leave the house and when we introduce Riley to new people. With the one very reasonable payment we made, we appreciate being able to call or e-mail Kathy day or night if any new problems arise, and know she will make time for us as soon as we need her. Whether it be tomorrow, or ten years from now, we know we have Bark Busters to turn to for excellent and effective training. The training is so easy to implement and we saw major changes in our 1 year old golden retriever in a matter of days! This experience was amazing and worth every penny. The security that I feel knowing that if there is a problem, my trainer is just an email away. And I have many questions being a first time dog owner and my dog being a very special snowflake. I adopted Daisy from a friend who had loved her for three of her four years of life, but never trained her. So I took in a dog that was disobedient, protective, and not potty trained. Within the first week of training, Daisy was beginning to be obedient. Within the first month she was off leash and her recall was spectacular. Potty training has taken longer, but has been successful with minimal accidents in the house. Crate training is still a work in progress, but having the support and knowing someone will be there to answer all of my questions is amazing. My husband and I adopted Gracie from a friend because he could not keep her. She came into our home with welcoming arms and we had one other dog named Jack. From the start she was skiddish and afraid of other people. We had never experienced this behavior before and we have had dogs our whole life. We could not invite people into our home because all she would do would bark. When Katherine arrived at our home we just let her be who she is. Katherine was concerned about how stressed Gracie was and we started our 2 hr training. By the end of our training she had calmed down and we learned how to train her in ONE visit . Jack need a bit of training for barking as well but not as much. Katherine and Barkbusters saved my family. AMAZING. We followed her instructions and after 2-3 days they were 99.9 better. The training was simple, but you have to be consistent. We in fact, did not need a second visit. Today, Gracie is a different dog. She is calm and happy and so are Mom and Dad. I brag about the training to all my friends and family and highly recommend Katherine at Barkbusters. IT WORKS. We say, It was the best money spent. My husband was skeptical at first but he is a true believer and the training we received was simple. Thank you Katherine and Gracie and Jack thank you as well. For all you out there with your furry family members who are having problems, call Katherine at Barkbusters. Highly recommended. "BAH"
Katherine Simkins is an outstanding dog trainer. We contacted Bark Busters to help deal with aggressive behavior from one of our two Schipperke's towards other people in the house, including the owner. She taught us how to respond to our dogs in a positive yet firm manner, without any physical threats or intimidation. She made us feel empowered to become the "pack leaders" and helped us understand why this role was of such importance for canines in any household. Katherine was very patient and thoroughly explained her techniques. She followed this by demonstrating the activity and then had us each practice it while she observed. Katherine has come to our home twice within a month which reinforced whether we were performing the exercises correctly. Our dogs have responded very well to this training. There is certainly a learning curve, but with consistency, our dogs behaviors have dramatically improved. They are listening better, are less aggressive, and have been much more focused since the initiation of this training with Katherine. Our dogs are 9 years old and we sincerely believe that you can teach old dogs new tricks. 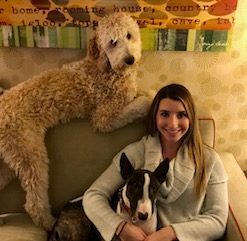 We look forward to working with Katherine over the next year and progressing in this training system to make our home a happy and safe environment for us, the dogs, and all visitors. I am still in awe of Katherine and her training skills! I have Pomeranians that are constantly barking at anything and everything! Katherine came to my home and after her first visit, I noticed the biggest difference in my dogs. This is all done without treats or shocking, and if I didn't know better, I would think these were different dogs. Katherine is not much bigger than my dogs and she always has a smile on her face. I had about given up hope but I am so glad that I contacted Bark Busters. "Kat the Dog Lady" was an extremely nice person with very positive energy, she helped us display that calm confidence too and, near immediately, changed the way our two Corgis were responding to and behaving around us. With newborns in the family we needed a gentle but effective way to keep our beloved Corgis in check. Kat has given us the tools now to do exactly that, and it feels so good! Training has gone quick and easy with our independent Basset Hounds. They are 4 years old, one we have had since 8 weeks old, the other rescued 6 weeks ago. They have stopped running to the door when someone comes, and they come when called! We are now working on leash training with our trainer and it is going very well. Katherine is a very thorough trainer! We found Bark Busters online and are very happy with the program. We enjoy that it is in home training and is not treat driven. As we are getting ready for our first baby our dogs have much behavior modification to achieve. Also, getting them ready for this new addition was why we sought out training services. Katherine has opened our eyes to many new tools and the program, with LOTS of practice and commitment, is working. We have implemented these new strategies and see great change. I enjoy the format of Bark Busters and am confident that we will have access to Katherine as we continue to face new changes. It is important to know that for any of this to work it has required about 10-20 minutes of work each day. You must be committed and stick with the homework assigned or else it is not effective. Katherine does a great job at guiding you and her follow up appointments help to hold you accountable. Katherine is an excellent trainer. She listened to our needs; helped us understand what our dog required and was very patient with us. I would recommend Katherine as a trainer. I think my exact words to Katherine during our first lesson were, "It's working like magic!" I can't express how grateful I am for Katherine and this program. My almost 2 year-old pup, Damian, is one of the greatest pets I've ever had. He was always well-behaved and friendly to other animals and people during his puppy years, and I can't recall a time where he had any serious behavioral issues. But last fall, my fur family and I went through several major life changes, and it was clear that it really took a toll on him. It started with loud barking in the house whenever he heard a noise outside (I swear he was just barking at leaves blowing in the wind at times). Then, upon moving into a new apartment, he began aggressively barking at anyone and anything while taking our walks around the complex. Although he was secure on a leash, neighbors were frightened by him (all 20lbs of him). I was frightened at times, and so confused. Why was my sweet pup becoming aggressive? What was I doing wrong? I tried different things before seeking out help, but nothing worked. After nearly 2 months of desperately trying to fix the problem on my own, and one embarrassing noise complaint from the front office, I decided to call Bark Busters. It only took one lesson with Katherine, and Damian was already showing improvement. The most important thing I've learned throughout this program is that it all comes down to me. I've learned how to be the pack leader in my house, the one all my fur babies look to for direction. It's been so rewarding learning how to be this for my pets, and such a relief to be in control again. This program is not only solving my issues with Damian, all of my pets have benefited from this, without me even realizing it! I can't thank Katherine enough for her help. I am so happy with how things are going, and so are my animals. I will, without a doubt, continue to refer Bark Busters to anyone who is having trouble with their pets. Thanks again Katherine, you are incredible! I was in tears when I called Bark Busters. My 5 month old puppy who I got from a so called breeder 2 weeks ago had never been trained in anything. But yesterday Katherine Simkins, Trainer, showed me how to stop Mollys continuous barking when I left the room. I can walk both dogs using only their regular collars, not the chain or spike collars I was using. I am 100% sold on this way of training. Thank you for saving Mollys life. Katherine was amazing. Patient and knowledgeable . I was really impressed when after the first visit she called the next morning wanting to know if I had any questions!! I would dread it when people were coming over because they would jump and bark. Not now.!!! And it so simple and quick to get a positive response. We are very happy with Katherine and all that she has taught us. We had picked out Remi at the Humane Society. She is a beautiful 4 1/2 year old Pointer. For the most part she minded well and was housebroken, but she wanted to chase our cats. So we looked for some training for her rather than have to return her. The Humane Society had provided a list of trainers to contact. I chose Katherine because it said she came to the home. We booked a Saturday morning visit. Katherine arrived on time and began her training by speaking to us. During the session she explained how and what dogs respond to and then she began training us on how to train Remi. After the session, I took Remi out for her first Post Training walk and the difference was amazing! Prior to training, Remi was on an expandable leash and roaming everywhere, but always came back when called. She would chase after birds, rabbits and the odd noise. Now she walks next to me! And likes it! She responded so well to the training (as we did, as well) that the transformation is amazing. I never thought it could be so easy to work with a dog and have them understand so easily what was expected of them. Remi isn't quite to the point of totally ignoring the cats, but she doesn't go looking for them nearly as much and responds when growled at to come running. Katherine was patient with Remi and my wife and I and got us all in tune with the training. Remi had spent more time with me, so getting her to respond to my wife was important. Now, Remi responds to my wife and I in the same manner. We are very pleased with Remi's progress, Katerine's methods, and Remi seems to be enjoying life even more in her forever home! Katherine has been a wonderful asset to our household and the training of our dog, Arnold. He has improved immensely in the short span of time since we began training. I would highly recommend Katherine and her training services with Bark Busters. She has been more than accommodating, extremely knowledgable, and very pleasant work with. After moving to Reno in September from opposite ends of the country, my boyfriend and I struggled to introduce our dogs and maintain a peaceful household. We quickly decided to seek professional help, and spoke to multiple trainers in the area. Katherine was by far the friendliest and most helpful trainer I talked to. She came to our rescue in early October with the perfect tools and guidance to teach us how help our dogs. She has been such a wonderful resource. I would recommend Katherine and Bark Busters to every dog parent!